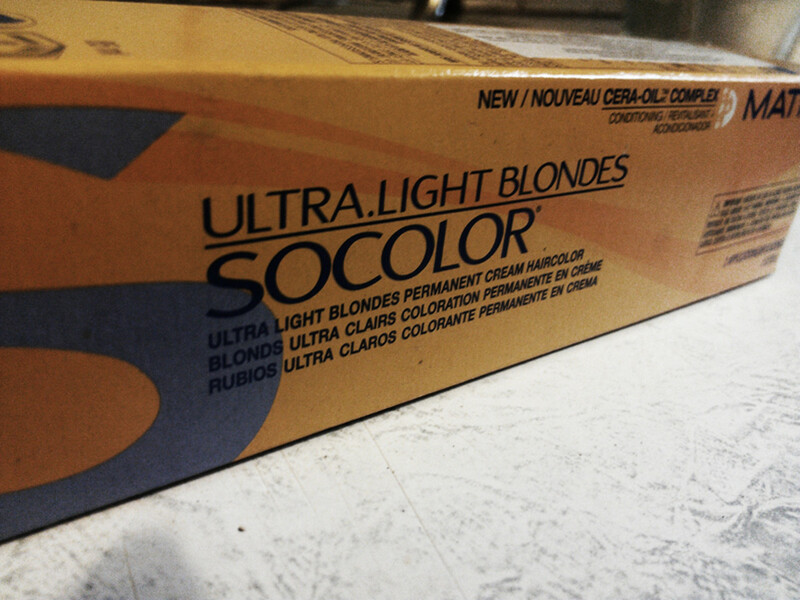 Dyes, lightener, peroxide, and tools for coloring and bleaching hair. Before you can dye your hair blonde, you need to assess the condition of your hair. Hair that is in poor condition is not a candidate for bleaching and it is best to avoid putting it through the misery of further damage. The use of heated styling tools and prior chemical processing can all reduce the integrity of your hair, so if you've recently either relaxed or permed your hair, bleached it, or dyed it one too many times, you shouldn't be applying bleach or blonde dye. You will also need to approach the process in a different way depending on what you've previously done to your hair and its current color. If you've dyed your hair black, a professional salon is your next step, because the stripping process is outside the scope of unqualified hair enthusiasts. This isn't the case with hair that is naturally dark, however. Natural black hair is significantly easier to lighten than black dye is, and the process can be completed in the comfort of your own home. Once you've ascertained whether you're a candidate for blonde hair, you'll need the materials listed above in order to complete the process. When bleaching your hair, you'll end up with superior lightening and less damage if you use a high quality professional brand of bleach powder rather than the cheapest one you can find. This is important because the degree of lightening will determine how blonde your final result is, and less damage to your hair is always a good thing. Whether you use a white- or blue-colored powder is completely up to you and doesn't really matter in terms of results. The intention with blue powder is to add tone to the hair whilst it lightens, but it rarely works to that regard. In fact, the blue color can work to the contrary by making your hair look lighter whilst it's in the hair, causing you to remove it too soon and making you end up with hair that is brassy and problematic for toning. In order to apply the product, you'll require an assortment of sectioning clips and a good tail comb to part the hair, and a tinting bowl and brush. You will also need a blonde dye which will be applied after you've bleached your hair. This tones the hair to take it from bright yellow to whatever shade of blonde you desire. All hair dyes and bleaches should be applied using gloves, and either vinyl or nitrile gloves are superior for this purpose. Latex tends to cling to hair and hurt. Bleach powder needs to be mixed in a one to two ratio with developer. In this sense, if you were to use 30 grams of bleach, you would need to mix it with 60 milliliters of your developer. The developer is ranked in terms of how much hydrogen peroxide it contains, which is qualified in terms of the volume of oxygen that is produced. The only thing you really need to understand about this is that 30 vol developer has a greater oxidizing capacity than 20 vol developer. If your hair is dark and in good condition, you'll achieve the best results by using the 30 vol developer, whereas if you have lighter brown hair, 20 vol developer will be sufficient to lighten it to blonde. Before you mix the bleach together, section your hair into four quadrants. The first part should be made all the way from the middle of your forehead to the nape of your neck. The second part should be made from eye to eye. Once this is done, you'll have your four sections, and this makes it easier and quicker to apply the bleach. The quicker you can apply bleach, the more even the result will be. When you're ready to begin applying the bleach, start at the back of your hair at one quadrant, using the brush to apply ample amounts of the product. You should apply the bleach in thin sections of hair from the top to bottom of the quadrant, using the tail of the tinting brush to lift and part sections as you work. When you complete that quadrant, move to the other back quadrant and continue in the same fashion before repeating the same process on the front two quadrants. Work as quickly as you can whilst ensuring you don't miss any areas. When you're done with the application, you have your first chance to rest and recuperate. You can use this time to prepare shower items and laundry so that you're ready to rinse it out as soon as the processing is complete. Whilst this video details an application of hair dye rather than bleach, the application is exactly the same. Notice the way the hair is parted, and the way sections are taken from the top of a quadrant, applying the product from top to bottom. The bleach should be checked every 5 - 10 minutes to gauge lightening, and this can continue for up to an hour or more. Bleach becomes weaker the longer it's in your hair as the chemical reaction taking place slows down. If the bleach is no longer lightening and you haven't reached your desired level of lift, you may need to bleach it again. This should never be done on the same day. Leave at least a week between bleach applications and only apply a second time if your hair is able to withstand it. You can apply an ash toner to counteract warm tones while you wait to bleach it again if this becomes necessary. When your hair reaches the color of a banana, it's sufficiently light to remove the bleach. Of course, you can rinse it out sooner if you're aiming for a darker blonde. The key for lighter blondes is to make sure that you have reached the yellow stage, or for darker blonde you have reached a yellow-orange stage. Hair that hasn't been lightened long enough will end up looking overly dark orange or red in shade, and this can not be toned to blonde because it is still too dark. To remove the bleach, wash all the bleach out with an ample amount of lukewarm water. Maintaining a cooler water temperature will help soothe the scalp and prevent irritation after bleaching. Ensure that you have removed all the bleach before shampooing your hair twice to remove any residual product. Application of conditioner is unnecessary and will reduce penetration of the toner. Now that you've stepped out of the shower and your hair is a thorough shade of yellow, this is where the magic really happens and you're almost ready to step out into the world with blonde hair. The last step to dyeing your hair blonde is to tone it so it goes from yellow to an alluring shade of beige or platinum. The dye you use should be a quality salon brand just like the bleach powder. Drug store dyes simply aren't up to the task and won't offer you the best results. The shade you use will determine the shade of blonde you end up with, and you can choose anything from a pearl-beige to an ash tone. Warmer tones shouldn't be used because your hair already has too much warmth after bleaching. Even if your goal is a golden shade of blonde, you need to tone it with a cool-toned dye to eliminate some of that warmth and achieve a natural color. Application of the dye is as simple as following the sectioning method you used to apply the bleach previously. The dye should be mixed in a one to one ratio of dye to developer unless the manufacturer specifies a different ratio. In contrast to bleaching, you will only need a low volume of developer like 5 or 10 vol to tone your hair because you do not need to lift out any more color. When you tone your hair, you're depositing color only. You'll need to pay more attention to the dye as it processes, as it is easy to over-tone your hair if you just leave it unwatched. Apply the dye and watch it carefully until it has processed to the desired shade, then rinse the product out and condition your hair. Do you dye your own hair blonde? No, I get it done at the salon. Nobody will ever be able to prove that blondes have more fun, but now that you are one, you can test the theory for yourself. You might never look back. Do you need more help dyeing hair blonde? Leave a comment for tailored advice. I bleached my roots of hair to level 9 and rinsed then applied wella t18 toner. Rinsed and then applied manic panic diluted violet. The purple did not take and my roots are an ashy blonde now. I waited a few days and tried the purple again and nada. Whats the deal? I hope this is helpful to many people. Hello, I bleached my hair and it ended up yellow, not really bad, but it's there. I waited a couple of days and bought ultra light natural blonde dye from Garnier. The blonde is about 2 shades lighter than my yellow blonde. I did a strand test and it turned a greenish gray! Why did it do that? I figured going lighter would be safe. Thanks in advance for your help! Hey! I have a really short pixie and am plannig to do heavy platinum highlights on light brown hair. I had a horrible experience at the salon with two different hairdressers! I went from brown/grey to orange/brown. I did a box color over it to cover the horrendous results. Now that is washing out and my roots are coming in. I plan to use a ligjtening powder and 40w developer and brush it on since it is short. Will I need to color (tone) with a shade of blonde after? I went to a Sally Beauty Supply and they didn't mention having to use a second process. I have highlighted in the past and done fine. I am super parinoid after this last bout at the salon! Any words of wisdom? it is difficult to bleach and dye your own hair if you do not know the products and processes. My hair is finally pale yellow. I toned with wella t14. It's still quite bleachy and unnatural looking. I don't have a particular shade in my mind but something Sandy and natural looking.. any recommendations ? Love your articles!! Can I use this method when retouching my ombre? I currently have my natural Level 7 Dark ash blonde hair color that fades into a very light ash blonde. My hair has grown a lot, its been about 9 months since my last salon visit and I'd rather do this myself at home moving forward. So im just wondering if this is something I can do with ombre? As for the toning portion, do i put it all on my ends or is it ok if some gets into the upper section of my natural hair? Also i was thinking of using Wella products. what are you thoughts on that? ps. wow...wrote that last night at 2am! Think I;m a natural level 6, or just a little lower, have hazel eyes and with any of the orange near my face...it just doesn't mix. I do hope to hear from you :-) Thank you so much!!! I will apologize in advance. There is a good bit of crazy history. The good---no box color whatsoever. I"ve been reading your articles and comments for a while. THANK YOU! There are just so many of us who are either creative, want to be cost-effective, and want the result we truly want and want to be able to keep up with it at home for time/cost sake. This would be me :-). 8-55 and 9-7 on some of the underside midlengths to shoot for a somewhat sombre look to lose the brassieness, making part of the base a little darker. Okay, but still a bit dark and a bit reddish now and of course, no lovely reflects like i had with the speed lift. too opaque. SOO....I dropped Olaplex on doing highlights, as I couldn't get it to lift enough by an hour. I wanted bright light highlghts but still had a good bit of orange at the roots especially with the olaplex). Would love a natural look, not silver , not pink, but not so warm. I went to 40v with the wella multi blond. WOrks better, but of course ,more damage. cholesterol helped tremendously. Very soft and nice now for the most part, but not back to my Olaplex solid, shiny, perfect state it was in. Now I added igora 9-1 with only a 10v to try to get rid of the super brassy roots. Hmmm. It's kind of a weird color (also because I toned with Pmix just before mostly around zone 1). Wish i could just send you a picture of what i am after for the brassy midlengths (the original speed lift igora was great, but just a level down would have been nice too) but don't know how to refresh the midlengths when it fades so brassy!! I wanted to quit doing it just because of that....I LOVE hightlights, don't want 100% blond all over, but a lot of highlights that I do partial foils on myself are fun. This is getting expensive and time consuming. Of all the videos, blogs, etc. I've read and watched, you seem by far and away the most helpful!! 1. figure out how to handle the roots that I dyed with 9-1 to (which by the way missed the several grays I have--probably because i only used a 10v) to just get them to a 7 or 8 cool color (i believe I am a natural level 6 or so) or even back to the lovely speed lift result...if it would stay! I love doing this on my own. Seriously. I love getting the colors I want to keep up with on my own. I really need a fix, and a new plan going forward. This may sound incredibly confusing. So look forward to hearing back though!!! I would love your opinion on Wella. I am switching from Schwarzkopf Igora Royal 8-4, and 8-5 (8-5 has been discontinued) and going to try Wella Koleston perfect. Do the level 8's in Wella run any darker than Igora or will I be able to keep the same basic level using Wella 8's? Thank you so much! Apologies for the late reply. You won't be able to get it to a level 7 from black with dye alone unfortunately, because it's just too dark. You can expect about 4 levels of lift at most from a quality permanent dye using 40 vol as the developer, or up to 5 levels at most from high lift with 40 vol. This sort of result would take the black colour to a light brown, which would look closer to medium brown when you take toning into account because a lot of ash tone is required to deal with the deep red warm tones that are revealed during the lightening process. Ideally, to achieve the colour you want, you'll need to bleach the extensions to gold, and then tone to counteract the warmth and take it closer to a neutral medium blonde. The shade you'd use for toning in this case in Koleston could be a mix of 7/1, and 7/0 or 77/0, but you'll get the best results by basing your colour choice on the appearance of the hair after lightening. For example, if there is still a lot of copper tone present when you get it light enough, this needs to be accounted for when toning because the shades I've recommended above won't work as well. In this situation, 7/1 by itself is a better choice for toning, or use the above mix and add ash corrector. The Ardell product should be fine, but using a dash of Koleston's 0/11 or 0/88 is optimal because these concentrates are the same brand you're using and designed to be mixed with other Koleston shades. A little goes a long however, because they are strong. 0/11 is pure ash tone, which is a combination of blue and violet pigment for counteracting orange and yellow tones and intensifying the ash tone of any other shade, whilst 0/88 is pure blue tone and should only be added in a very small amount to counteract strong orange tones. Apologies for the late reply. You can use a high lift on hair that is previously processed, but you need to be sure that your hair is strong and healthy before you do this. Overall, it's not the best thing to do if you can avoid it, but neither is bleaching hair excessively either, so base it on the condition of your hair and what you need to achieve. Why you need to use the dye again, may be a better question though. Is your hair still a little darker than you want, or were you just wanting to refresh the tone of the lengths and get it to look even and consistent with the product change? For a colour refresh, the dye only needs to be applied to your lengths towards the end of development of the roots, so it won't matter anywhere near as much if you're applying it to hair that has been processed before. Of course, use your discretion here. If you have the time to prepare a separate batch of the dye, you can mix the high lift with 10 vol developer and use this for refreshing the colour of the ends to greatly decrease damage. In a situation where you need to lighten it a bit further though, this is a bit more difficult. You can technically use the high lift again for this, but depending on how many times you've toned it and what other treatments you've performed, it may not lighten much further with another process. An alternative to this is to bleach bath the ends, which again you should only do if your hair is strong and healthy, to take them a little lighter, then use high lift to touch up the roots and finally to tone the lightened ends to match. As for getting an even colour and maintaining this, the key is to apply anything that lightens as quickly as possible. It's fine to even use a little extra product for this to make it easier to saturate the hair quickly and ensure you can coat every section in the least amount of time. When you work on dark roots, you should focus on lifting these as close to the same base tone that your lengths were lightened to to ensure there is no banding. That way when it is toned, it should reach the same shade. Using the same brand and shade is ideal when dealing with regrowth, but if you want to change brand you can still keep it even. The bleach bath method I mentioned above can be used for this if there's a lot of previous dye pigment built up. Applying it for about 5 - 10 minutes to strip out the tone and then toning the roots and ends with the same shade will make it even as long as the roots and ends are the same lightness. Another option is to use dye remover if the tone is permanent, and this can strip it out without any bleaching or damage whatsoever, allowing you to then adjust the colour. I bought black clip in extensions, and would like to dye them the same colour as my hair. I would like to buy the right products, in order not to get red or ash tones. I bought Koleston 77/0 but not sure if that is the right dye to use. What shades of Koleston Perfect color and toner should I use to achieve the desired color? Also, should I use Ardell Red and Gold Corrector to cancel out reds? Big Thanks!!! I used high lift color to lighten my hair, but now I would like to change products to do my roots. Can I use the new color to do my whole head, or is it too damaging to use high lift on top of high lift? Do you have any suggestions to maintain an even color? Thanks! Red filler is not required; it's used to pre-pigment darker brown shades and black. Depending on how much darker you want to go though, you may need to fill with yellow or gold. Base it on the level you want: for light blonde, the base tone is yellow; for medium blonde, the base tone is gold; for dark blonde the base is golden-orange. If you take the level of blonde you want and use a demi-permanent dye in the colour of that level's base tone as the filler, this will give a rich and natural looking result. Otherwise, you can also do this by mixing the golden blonde shade you want with a natural shade. Eg, medium natural blonde and medium golden blonde. The natural contains a balance of the primary tones, so it darkens and dyes properly. If you don't fill your hair or use a natural shade, the dominant tone in the shade you do use will often become very intense. This means that ash shades can turn grey, blueish, or greenish; beige and golden shades can look fluorescent yellow or a brassy colour; and copper and red shades can look flat or purple depending on what tones are present within the colour formula. I want to go from a platinum blonde to a light golden blonde or caramel color. The platinum color was achieved with bleach and toning only. 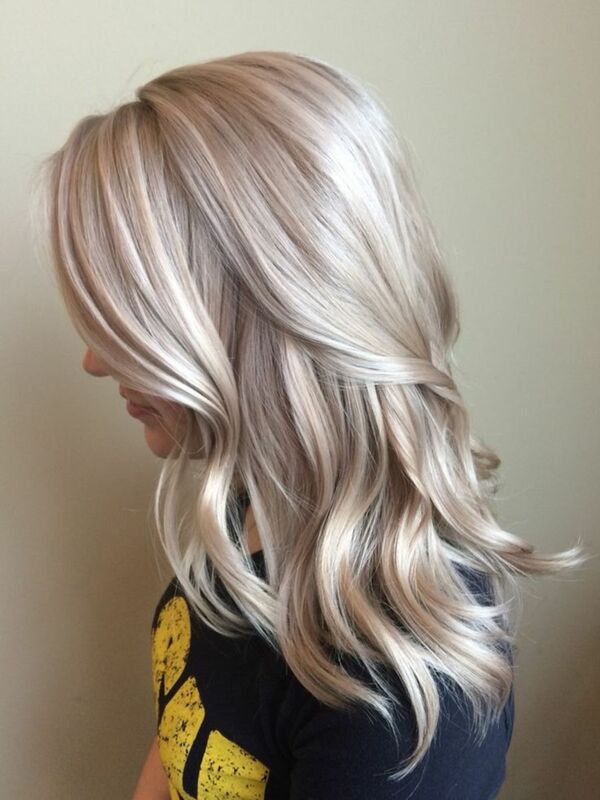 How do I achieve this new color? Is a red filler required? That's perfectly fine to do. Best to fill with a copper protein filler or copper demi-permanent dye 1 - 2 levels lighter than the shade of red you want first though. This gives a richer red result; especially if you want any shade of red that has a soft violet tone to it like mahogany or 'cooler' toned reds as these will often end up looking purple when applied straight on top of lighter hair without filling first. Thanks for helping me I would like to go back to my red color because my hair is damaged now can I just use a red dye ? Bleach wash it for about 10 minutes or so until the ash lightens and warms up, rinse, and then re-tone if necessary. If the dye was a permanent dye, you can remove it using hair dye remover. Use this to strip the colour out, then re-tone as necessary. The colour can be toned using a mixture of a golden shade and a dash of red to correct the ash to a neutral to beige blonde. This method will result in the colour remaining darker as there is no actual removal of the dye. The toning masks its appearance. If you have a particular method you'd prefer to use, let me know and I'll give you more information about how to use it to correct your colour. I bleached my red hair to light yellow then I dye it with an ash blonde and it turned gray I need fix it fast what can I do. Why did go gray ? It depends a lot on how dark the banding is. If it's darker than the rest of your hair, it's always going to be somewhat more obvious because of the difference in levels. You can definitely tone it to neutralise the gold, but you'll still see it as a band of darker colour. If you want it as even as possible, the best way to do this is lift it to match the level of the rest of your hair before toning. As for evening it up, feel free to use dye remover if you're sure the banding is leftover pigment from a permanent dye. A stain from direct dyes won't be removed by this though, and can be stubborn to bleach out too. There's also no guarantee the dye remover will strip out the dye when you get to that last trace left. It doesn't cause damage, so there's no reason you can't try the dye remover if you want, but it's a step you can skip if you're working on a budget or don't have much time. After that, bleach is really the only way to get the hair lighter prior to toning. Lift from any permanent dye is going to be very minimal if noticeable at all; especially if the darker hair is previous dye, which won't lighten effectively with more dyeing. Natural pigment can be lifted by dye though, and any remaining natural pigment in your hair can be lightened to make the colour lighter by reducing the overall amount of pigment from melanin and dye combined. Follow that up by toning with a violet based dye to eliminate gold or yellow. You get a green tinge if you apply a blue-based dye over gold or yellow hair because yellow and blue mixes to create green. Technically, you can use the 12/96 with 10 vol developer to tone and it does have a violet base, but keep in mind that it is a high lift dye and contains a lot of ammonia. It will cause more damage than other permanent dyes even when used with a low volume of developer. Another option would be to use 10/1 in Wella Koleston (The /1 ash tone is violet based when the dye is this light), or use Wella Color Touch in either 10/1, 10/6, or 9/16. The Color Touch is a good option because you can apply and then rinse as soon as it reaches the tone you want without the damage or full processing time of a fully permanent dye. Sorry I just had additional thought - the banding *might* not be staining from dye, it might actually be my hair's natural pigment as they're probably the parts that have been bleached the least. Thank you for a very helpful and informative blog! I have been trying to get rid of some gold banding in various parts of my hair, left over from old golden brown permanent dye (I had sort of a 3-tone ombre). My hair was recently bleached and is now almost a uniform bright blonde, maybe level 9 - 10, except for the slightly darker gold banding. I have managed to fade it significantly with some gentle spot bleach-bathing. Toning helps somewhat, but doesn't really touch the gold parts. The closest I came to a satisfactory result was with a very pale ash blonde [box] colour which I used as a toner (with my own 10 vol developer - I have been using lots of my own concoctions) but unfortunately it gave the overall colour a kind of a dull, greenish hue and I removed it with another very gentle bleach bath. Anyway I have now ordered some decent colour - Koleston 12/96 - and I plan on using this with a low strength developer again (probably 10vol) and focusing on the gold parts. I am hoping the blue/violet will counteract/neutralise the gold if nothing else, and will grab in quite a pleasing way on the paler parts (as opposed to a blue/green). Is this a good idea? Should I instead have ordered something with less lift and more deposit, maybe at a level 9? Or perhaps something deposit-only? I admit I got excited looking at pictures of the Wella 12/96 as it looks like it leaves a lovely pinky hue on bleached hair. Will using a low strength developer drastically reduce the dye's effectiveness? Deposit is more important than lift at this stage, although a last little bump of lift might help on the gold parts. Do you think the 12/96 will be enough to neutralise the gold? The gold is probably a level 8-9, albeit artificial. It only recently occurred to me that I should have used a colour remover and I still could, if it wouldn't be too harsh on bleached hair, but at this stage if I can just neutralise/blend the gold I will be happy. My hair's health is holding up quite well so far. I have been using lots of coconut oil and Redken protein and watching the condition and the stretch factor like a hawk. I have had no breakage so far and it feels great, but there are some very pale blonde parts of my hair in between the bands so I don't want to push my luck. Anyway I hope that all made sense and apologies for the high word count and multiple questions! This happens a lot. The hair isn't lightened enough, and then the hairdresser won't use a toner that is strong enough because doing so, whilst it would correct the golden orange colour, would darken it past where you wanted to reach due to the amount of cool tone that would need to be added into the hair to fully neutralise the warmth. Then, adding highlights is a cautious technique. The idea is, lighten part of the hair further and if it becomes very damaged, the damage is less noticeable and it won't completely destroy your hair. The lighter highlights cause the overall look of your colour to be lighter, and if you tone them heavily to an intense ash, they cool down the overall tone too. Problem is, with the amount of warmth and how dark your hair still was, it doesn't work well enough. What you're left with then is two different levels of darkness, spread out all over the place, which is an issue to fix. If all of your hair was bleached again, the highlights are exposed to an additional bleach process and there is a very real chance of breakage to that hair if there is already a lot of damage. If you're noticing it stretches apart of breaks during combing; especially when wet, this is a really good sign that it's at this point and I wouldn't recommend pushing it any further for the time being. Even retouching your regrowth will present a problem because the most precise regrowth application still contacts the damaged lengths at some point. Where the regrowth and lengths meet, the bleach or dye used on your regrowth could weaken it and cause it to snap at this line. As for reaching platinum, I wouldn't recommend it until your damaged hair has just about grown out. Even if you continue to use the Redken protein treatments, there is only so much your hair can take and yours is just about at its limit. 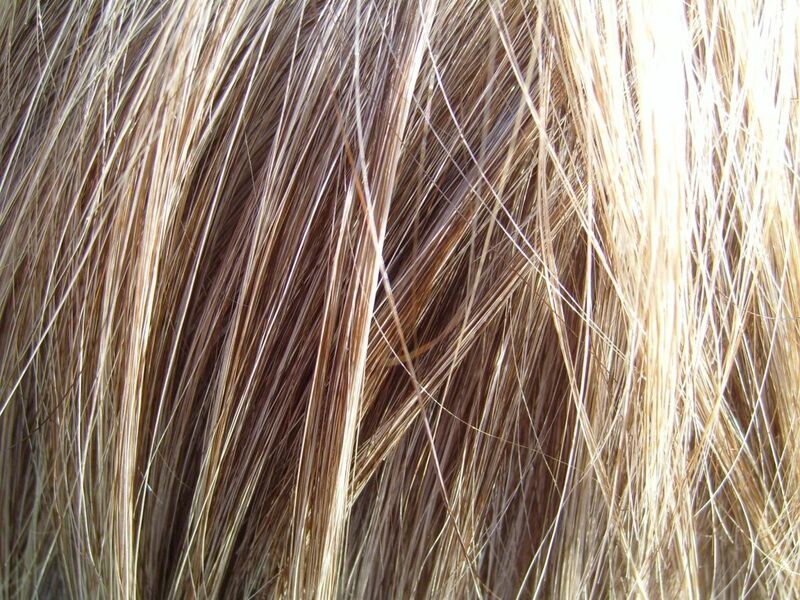 Your hair may be naturally more fragile, or the amount of dark dye and bleach both contributed to the weakened condition. Developer in dye, even when the colour is dark, causes damage, and some box dyes can also contain metallic compounds that react badly with any bleach that is used later on. As for what you can do to try and fix the colour in the mean time, semi-permanent dye is the best option because it is completely non-damaging. Use this for toning if you need to eliminate warmth in your hair. Depending on how much lighter your highlights are compared to the rest, you may want to use two different levels of ash dye, applied in foils to the different areas to get it to all tone to the same result. It will still be uneven unfortunately though, as toning will only neutralise the warmth. If you want something all the same colour while you wait for it to grow out, apply medium natural blonde in semi-permanent all over. This will darken your highlights and lengths to the same medium to dark blonde result. With how damaged and porous your hair is likely to be, this colour will probably last longer than a normal semi-permanent dye would, but you may have to reapply it every few weeks to maintain it. You can mix a little medium ash blonde into the natural for a cooler result if desired, but you really need to use the natural tone primarily when darkening and evening out the depth because it contains all three primary colours. Dominant tones like ash, golden, etc won't darken hair properly when used by themselves. You may also want to trim it shorter if you don't mind losing some length, as the further hair from your scalp is weaker as it is usually exposed to more dye and treatments over its lifetime. This helps it grow easier by preventing split ends that could continue to tear down the length, but mostly it's just personal choice should you wish to do it, and is one way to get it to look healthier while you wait for it to grow. Let me know if you have any questions about any of this, want to try something different, or need any more help. Last year I went to a hairdresser and got my virgin hair dyed a dark shade of brown with a little gold in it. My natural hair color is a dark blonde (I think…because it turns golden over time, especially the thin hair on the side of my face…does that count?). Touching up the roots I later did by myself, selecting cool tones by L’Oreal (alternating between: Préférence 5.21 L’Étoile & 3.12 St. Honoré). Roughly a month later she toned it again. I think it was with a lighter shade of blonde - Sorry, I don’t have the correct numbers and names, but I know it was Redken. - But I could not see any difference. I was frustrated and went to a different salon with my get-that-brass-out problem. Unfortunately the lady suggested highlights and caught me with the argument that it would do less damage to my hair, which was already not in the best condition anymore (but getting better through my intense care, I hoped). So she did blonde highlights and toning, and I came out relatively blonde but still with to much brassiness for my taste. I had regularly used violet shampoo from after the first bleaching on and it helped a little, but could never tone down the whole issue in my opinion. That was the point where I started trying out different box colors: again L’Oreal Excellence Creme 10 Light Blonde, the Préférence 10.21 Stockholm Platinum Blonde and last weekend Excellence Creme 10.21 Light Pearl Blonde. I know it sounds like a lot, but I always waited until I found that my hair was ok again before applying a new treatment…and at least it gradually got me to a light but uneven blonde. It’s uneven because of the highlights, of course, but also because the grown out roots are now a lighter shade as the not-highlighted hair. Is it really impossible - ever! - for me to get to a platinum blonde shade? I mean, the hairdresser I went to yesterday told me that she would not bleach over highlighted hair because it could really leave me bald or something…I just don’t know what to do anymore! Should I just throw the towel and let it grow out completely to - 2-4 years later - have my virgin hair bleached to the shade of blonde I desire? Or can I hope to get the color evened out when it is in a better condition again? And maybe cut it to a more manageable length? ...because yesterday I had to stop that hairdresser completely from combing through my hair because she could not really get through (even with that Redken Extreme Anti Snap) and I felt she would really damage it beyond repair if I let her continue. Thank you for your incredible patience, if you read this whole message and thank you in advance for any advice you can & will hopefully give me. If the bleaching works that well and you don't have any qualms with it, it's definitely a better option. The bleach and tone double process is still the best way to dye darker hair blonde compared to using blonde dyes or high lifts. Other options are more just a compromise if you specifically want to avoid bleach or want to lift and tone all at once. It doesn't ever fully compensate for the control you get from lightening and toning in separate steps. That's quite a nice colour based on the picture. The underlying warmth really helps prevent the ash from looking too strongly grey and if you're happy that it's turning out like that, definitely keep doing it that way. Good luck with the regrowth touch ups in future and don't hesitate to come back if you ever have any more questions or are planning a new colour. As for the peroxide I have the essensity one at 28 vol which they say it's 30 will do the same effect as Igora 30 vol I guess? For my situation I found out and amazing thing, by going from lvl 9 to 7 half natural half ash I ended up with the most beautiful lvl 8 intense ash with some wooden "brown" "highlights" and beige/ ash and golden reflex which has a very natural look and the win win is that it looks natural on me and I won't be adding any highlights later . I will keep the advises and the formulas you provided to use 7 dye on re growth. But I think I might do this " formula" bleaching at 10 vol on me usually gets me to lvl 9 in 15 mins and it doesn't damage so much so I think I'll keep doing my re growth this way. It's amazing ! Wish I could show u something similar to what I have now. Again many thanks and sorry so many questions and doubts. 2:1 dye to E-0 lightening extract. This can add up to one more level of lift. It will dilute down the colour intensity though, so you need to take that into account. The Igora 7-12 should be more effective than 7-1. It contains more ash tone overall, as well as extra blue-based ash. For measuring centimeters of concentrates, use the measure on the bottom of a tinting bowl. The formula you said, the twelve rule, measure in centimeters ? Or millimeters ? If centimeters, how? Thank you so much I am learning a lot! Okay I might think using the igora 0-11 for eatch of us and thank you for explaining the correct formula! Now using the E-0 on my mother to help lift a bit, what would be its mix ratio? And to me you think that igora 7-12 would be a good shade at 30 vol ? I like the very intense ash it has and maybe the "2" will be able to neutralize the copper reflex ? You can use the rule of twelve for most dyes with concentrates to get a rough idea, but a lot of it is just titration based on the way it reacts with your hair, adjusting the concentration until you get the ideal amount for your own goal. If you start at 12 and subtract the level you want to reach, this gives you the amount of concentrate to add in centimeters. Eg, for a level 7 result adding an ash concentrate, 12 minus 7 is 5, meaning you would add 5 cm of the concentrate to adjust the tonal direction. This gives a stronger tone though so you may want to use half of this at first as you're already using an ash colour. Look at how well this works with the amount of warmth in your own hair and you'll have a better idea of how much to use next time. The E-1 is used slightly differently. At level 7, use about 2:1 chosen shade to E-1. It's a mix of all cool tones, unlike the concentrates, which are either one colour, or mostly one colour. This brings up another important point, -1 shades are adjusted at level. Darker levels are more blue-based or even blue-green, whereas lighter levels start to transition into a blue-violet base and then to mostly violet. There is still blue tone in a 7-1. The concentrates are different even though they use the same numbering system. 0-11 is mostly violet with a hint of blue, 0-22 is mostly blue, 0-33 is green, 0-99 is a pure intense violet but more designed for enhancing violet and violet-red colours rather than neutralising yellow tones, although it can be used for this carefully. Then if you look at colours like chocolate or naturals, the chocolate is an adjusted mix of all warm tones that is redder at darker levels and golder at lighter levels, whilst naturals are a neutral balance of red, yellow, and blue (All three primary colours - the combination of which is always neutral). That's good that the 8-11 worked nicely. You can always add a very small amount of concentrate to this for added toning, or add a little E-0 for added lift if necessary. A high lift can be used to lighten, but it contains more ammonia and is more damaging. They're roughly comparable to bleach, although slightly gentler and with the added benefit of also toning hair. They don't have a level though, and won't necessarily produce better toning than using the 8-11. Of course, if you want to lift and tone separately, it's an option to use the high lift for this and it will also cut down on the amount of warmth that needs to be toned after lightening. As for using a natural tone (-0), I wouldn't recommend this when you want to neutralise warmth. The natural tone is a roughly balanced mixture of red, blue, and yellow. It's designed to produce a neutral base. As it is balanced, it won't neutralise strong warm tones and mixing it with an ash tone will dilute the ash tone. Other thing, you think that a 7-0 added to the 7-2 would be a good formula to help neutralize the warmth as it is more neutral or only will help increase them ? Sorry forgot to add this to the previous post . You think the 7-12 would be a good color to use at my re growth ? As it offers 2 different based ashes for primary and secondary reflexes? I think that using high lift on me to cool the one tone lighter than my natural would be only ruining my hair or you find it a good solution ? I like the option of adding a concentrate to the formula but what would it be a reasonable mix ration of the selected shade plus the concentrate? I might go for 0-11 as it's a violet ash which still contains a tad of blue but mostly because I am lifting more than 1 level a greenish shadow afterward I'm afraid. As for my mother I used the 8-11 at 20 vol on the previously dyed and it was enough to remove the brassy to a natural looking almost neutral color. But I am thinking about the option you provide on other article to use a high lift on her so I can remove the " heavy warmth" and tone it after. And this because even tho she has gone hair, it is misre resistant to lift than mine and she is aiming to a lighter shader than I am so maybe lift her to a 9 and tone it 8 so it comes clear what you think? The colour of your regrowth is going to turn out differently because when you dyed the lengths, you were dyeing over lighter hair with a darker ash mix and this results in a stronger cool tone. The root touch up will involve a lot of warmth being revealed as it lightens and the exact same colour is more difficult to achieve because the colour result when dyeing hair is a combination of natural pigment and whatever colour you add. In the first situation, you are applying level 7 ash into hair that has underlying warmth at level 9. In the second scenario, you are applying level 7 ash to hair that has warmth at level 7. The use of the 7-2 by itself helps, but there's still no guarantee it will be the same. Lift and colour deposit occur at the same time but they're two different processes. If you increase the developer volume, more lightening will occur and the same ash tone that is being deposited does have more of an effect because there is less natural pigment making up the combined colour. You essentially end up lifting the natural pigment an extra level so that the dye is more dominant. It's one route you can take to avoid ending up with excess warmth. Other options include using a dye that contains more ash tone, or adding either an ash concentrate or a mixture of blue and violet concentrates to your chosen shade to increase the concentration of cool tone yourself. This is dependent on the dye brand having a range of pure tone concentrates though, and it'd be better to use Igora Royal if you want to go in this direction. Eg, add 022 to increase blue ash, or 011 to increase violet ash in any other Igora Royal shade. As for your mother's hair, using Igora Royal 8-11 is a good option to avoid the warmth. If it still looks a little too warm, you can always add concentrates to intensify it further. If any of these options is particularly preferable to you and you need more information about it, let me know and I will elaborate. Good luck with your colour. Hi, I loved this page and the amount of information you provide. Now the question, My virgin hair is a natural lvl 6 which I used to gently bleach to 9 and ton but got tired and dyed it 7 ash ( essensity 30ml 7-0 + 30ml 7-2 ( their blue based ash is 2) at 10 volumes. I came out perfect and I want to do my re growth the same color would the 7-2 at 20 vol do it or do I need 30 vol to get rid of some amount of warmth so the ash gives the cool tone the mid lengths have? I am asking this because my mother is natural lvl 6 like me and I tried to use an 8-14 ( essensity 1- blue violet, 4 beige) at 30 vol her roots got somehow coppery what should I do for the "8" problem? What would you suggest for any of these 3 situations ? Generally, an oxidative demi will be mixed with 5 - 7 vol developer depending on brand. Higher volumes of developer will develop the colour more fully as well as push it much deeper into the hair and this can cause it to turn out darker. It will still fade however. As for the beige; shine tends to depend more on the condition of your hair. Whilst it's true that golden tones increase the appearance of shine, this isn't always the case. The more damaged your hair is, the less smooth it is, and this causes it to look duller because the hair shaft is jagged and doesn't reflect light as readily. However, as you'd prefer the beige to be more golden, you may find it suits you more and does look less dull if you add more gold tone to it. Igora Mousse 9,5-4 or 9,5-55 is an easy way to do this as it can be used after shampooing to add gold tones to your hair and it also helps to increase shine. If you'd rather just get rid of the colour though, you can use dye remover. On demi-permanent colour, you won't see full removal as part of the colour is direct dye and this can't be broken down. Any permanent dye should be removed pretty reliably. Following that you may need to tone to get it to the new shade you want as it can show warm gold or copper tones just like with the use of bleach. As for how it lightens, the maximum change it can result in is the lightest colour you have been underneath any dye you have applied. Well, I dyed my hair and don't like it.. I guess naturality is not for me.. The balayage turned out well, no straight dark line (well, in the back there is few dark patches..) but it did become a lot darker than I wanted. I didn't realize that with a demi you should use a low volume developer, and I used a lvl 20 and after reading about the topic realised that my demi is now permanent. Is the easiest way to buy non bleach color corrector or what? Does my hair go back to a lvl then from the lvl 7 roots and escpecially from the lvl 9 ends if using a corrector? I guess bleach is not an option as my hair is not in the Best condition.. The level 9 will be better. Just make sure it's permanent or else it can't lighten your hair. The Igora Vibrance is fine for toning or darkening but it has no lift and can't be used for lightening. To prevent brassiness, use an ash tone for lightening. So should I use a high lift dye to lighten hair that's been dyed with level 7 or will the lvl 9 dye work? And it wont go brassy? Were you intending on reaching an overall colour or continuing with highlights? Dye doesn't lighten dye, but it will still lighten natural pigment. Dyed hair is a combination of both the artificial colour you add, and any remaining natural pigment. If you apply more dye, it is possible for the natural pigment to be lightened further, so the overall colour gets lighter even though the artificial colour is not affected. In principle, this will work better on hair that has been dyed with lighter dyes as there's less dye compared to natural pigment left, whilst hair dyed dark won't generally change. It doesn't matter when it's your regrowth though as this is new growth and will lighten properly as it hasn't been dyed at all. To retouch the balayage you can work in the same style by applying the dye in foil to the dark regrowth only. Ie, place foil underneath a section, then apply the dye from roots to the beginning of the lighter length only. This results in extending the lightened hair up closer to the roots without adding in any new highlights. I bought schwartzkopf igora vibrance colours, I'll be dyeing the lenghts to a level 9 beige and the roots to level 7 beige. I tried to ask about my dilemma with balayage but my english clearly isn't good enough =) ..
And when dye doesent lighten dye, I would have to use bleach and then tone? How does this happen? How can I bleach to the desired point and not my roots completely? Doesent that cause overlapping when I have now bleached my hair, then I dye the roots darker and when they grow too much I have to bleach them again? That's alright, you can ask as many questions as you want. It depends. Dye won't lighten dye. That doesn't mean it can't lighten your hair, but any lightening will come from the lightening of remaining natural pigment. It won't affect any artificial colour that is already in your hair, so the lift from the second dye can be slightly erratic and less effective. If you're trying to dye over darker dyes, you won't usually see any lift at all, especially in cases where the darker dye has been applied several times. With blonde shades though, there is less colour going into your hair and you should still see some lift from a second dye. You don't need to add ash tone to deal with yellow when colouring darker. A natural tone is better as it is balanced and won't lead to intense results that would otherwise occur with other tones. Eg, a darker ash dye causes the hair to turn grey; and the darker it is, the more chance it will even end up blue or green. Any darker dye you use on your lighter hair is going to end up more intense so you get around this either by using a natural tone (Balance of red, yellow, and blue), or filling it first. The easiest thing to do in your situation would be to use a natural tone for a darker neutral result. Mix in a little ash or gold for a cooler or warmer result respectively, but don't use either of those tones by themselves. As for the gloss, use Wella Color Touch Relights 0/00 if you want to keep to the Wella brand. It needs to be mixed with 1.9% Wella developer, but it doesn't really cause any damage. The short time it's on the hair, coupled with the very weak developer prevents this. Alternatively, Matrix Prizms Plus is excellent and isn't mixed with developer, so it can just be applied as is. Also, that's great that the protein treatment is working for you. It really does make a big difference in lightened hair. If I want natural/golden color to the lenghts, do I have to mix a little bit of ashy/pearl color to it to get rid of the yellow, and if so, how much? Also im interested in doing a hair glaze. I understood that you use a color with no tone? With what developer and how often should I do the glaze? Does it damage hair? P.s. The redken CAT is awesome stuff! That was balayage then. Basically, look at how your hair sits when it is styled and imagine how the sun might lighten it if it was sun bleached. Follow that general direction and apply colour to sections of hair by hand. It'll work best if you hold the section at a right angle, as well as angle the brush and lightly sweep it towards the end of the section on the top side only. A light touch gives softer results because it doesn't coat the hair completely. For every section you apply colour to, you should also be leaving a section untouched just like if you were highlighting with foils. If you cover all the hair, you will just end up with an overall effect rather than highlights. Treat one section, leave one section, repeat. 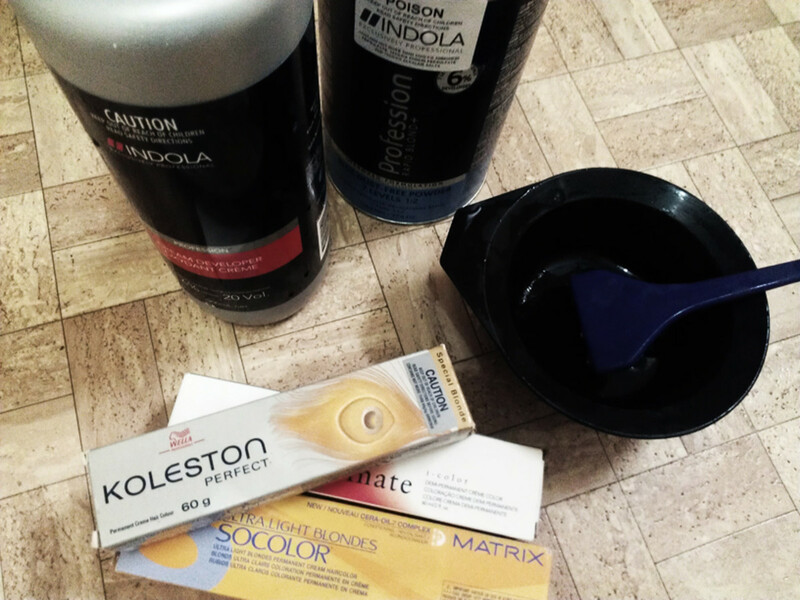 Wella Koleston is a permanent dye. You can use any brand of developer; it is all the same. However, Welloxon is formulated to match the consistency of Wella dyes so it will mix easier if that's important to you. Other decent brands will work just the same. Cheap developers often separate or just don't mix very well, and sometimes lack quality control in terms of potency. If lightening with dye, the colour must be permanent. Semi-permanent can not lift as it doesn't penetrate the hair and developer isn't used. 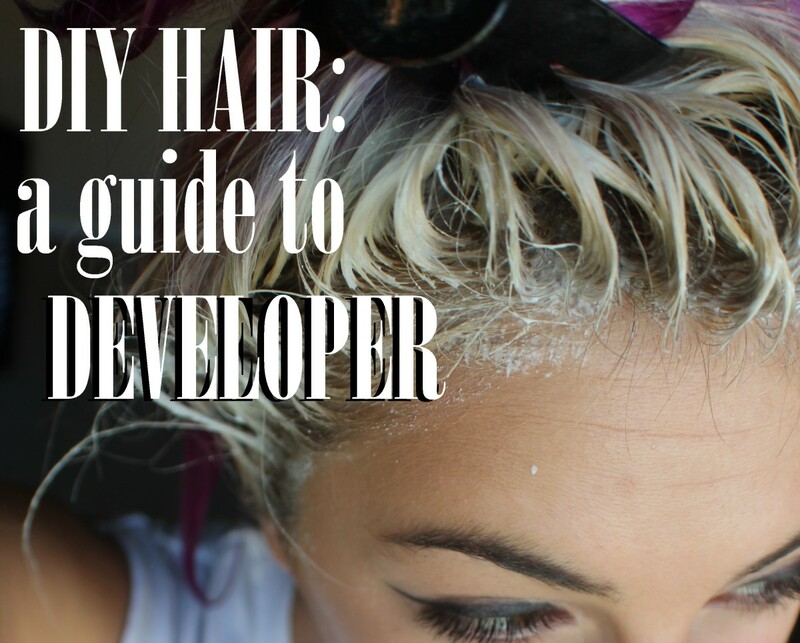 Developer is hydrogen peroxide and this is what lightens your hair in conjunction with permanent dye, as well as oxidising the dye so that it forms its intended colour. 30 vol is fine if you need up to 3 levels of lift. If you need more than this, use a high lift dye like Wella Koleston 12/11, mixed with 40 vol developer for up to 4 - 5 levels of lift. For anything more than this, use bleach instead. Base your product choice on how many levels of lift you need to effectively lighten the roots properly from their natural level to your desired level. Finally, if you do end up deciding to darken the lengths, it will turn out better if you use 2 different tones. A natural tone as one, and a mix of half natural and half gold tones as the other would produce a nice result that has extra dimension and depth to it. The hairdresser just "painted" the colour, no foils was used. Is the koleston a permanent or a semi-permanent color? Can I use a developer by any brand or just the welloxon? For the root touch up, I would ofc have to lighten the roots that i have darkened, so the color with 30 vol developer is enough, no bleach needed? Does that color need to be permanent or will semi lighten also? Should I tone with more than one colour or add lowlights etc? The confusion mostly comes from high lift dyes. Hair dye does two things: it lightens natural pigment, and deposits artificial colour. A level 8, for example, can lighten a certain number of levels depending on brand, ammonia content, and developer strength, but the artificial colour it deposits is always a level 8. High lift dye was introduced as a bleach alternative and can lighten up to 5 levels in certain circumstances, but how much colour is deposited depends on how it is designed. As such, because it doesn't really have a level, most dye brands call it something like an '11', '100', '1000, ultra lift, mega lift, or some other variation that makes it seem like the level system is broader than it really is. The traditional level system ends at a level 10, which looks white and any numbers past that are just to differentiate between actual 'level-calibrated' dyes and high lift dyes which are outside the standard system. For the bayalage, did your hairdresser use foils/meche, or just work with her hands? Using foils is traditional highlighting, whereas bayalage is like freehand highlighting as the dye or bleach is just painted onto sections of hair without the use of heavy sectioning, weaving, or using foil to separate it all out. You'll get the closest result to what you liked if you do it in exactly the same sort of technique as was done previously. If you can give me any further insight into what she did I can give you better direction here. Semi-permanent dye will wash out over time, but it can persist longer and sometimes more permanently on hair that has been lightened. It wouldn't stay dark, but there's always a chance that it won't completely come out of bleached hair. As for whether you use permanent or semi-permanent dye it mostly just depends on how long you want the result to last. Wella Koleston is an excellent brand, as is Matrix SoColor, Igora Royal, and ISO I.Color. You'll definitely get better results than supermarket dye. With the developer, use 20 vol (6%), for toning or darkening when using Koleston. Higher volumes of developer produce more lightening and you don't need this if you're just dyeing the lengths darker. When you get to touching up the roots though, you'd be using 30 vol instead. So, I said my bleached hair is about level 10 but you said that then it wold be practically white so maybe it's a 9 then, tho it is a very light blonde but when bleaching it never goes all white, there still is yellow. and I didn't like it anymore so I bleached everything again. I liked that it looked a bit more natural than just the peroxide blonde and I would like to get the balayage again but Im on a very low budget and I am terrified going to the salon cos I have an anxiety disorder and I always get an anxiety attack when sitting in the chair.. so now I would like to do it myself/get a friend to help. I just don't know how to dye the balayage style, and what do I do when the darker colour outgrows and I want to retouch it? My natural hair is a level 6 I think and I would like the root to be 7-8ish.. I have also considered that I would like to darken the bleached part with a level or two and go to a more natural, maybe a golden or neutral colour but Im afraid that I don't like my hair any darker and as you know I can't afford to bleach the already bleached parts again. If I dye with a semi permanent darker shade, will it lighten after enough washes? Do I need to use permanent or semi permanent colours and with what % developer? To dye hair blonde you at least need bleach powder, developer, a tinting bowl and brush, sectioning clips, gloves, and a blonde dye to tone it after it has lightened. The shade of blonde dye depends on how light of a blonde you want; whether you want a cool, neutral, or warm result; and what colours have been revealed in your hair from lightening. For bleach powder, I'd recommend a quality salon bleach like Igora Vario or Wella Multi Blonde. These lighten better and with less damage using only 20 vol developer. That takes you to the next requirement: you should only need and use 20 vol developer with salon bleach on scalp. If you're using generic bleach and dealing with dark hair, you may need 30 vol to lighten the hair to the same extent. Only use 30 vol if your scalp isn't sensitive and the bleach powder you're using can be used on scalp with 30 vol. Also, I like to recommend nitrile or polyvinyl gloves when working with hair. Latex grips and pulls hair and can increase discomfort and make it harder to properly section the hair while applying bleach or dye. Can you list all supplies used pleas? Perfect, thank you so much for your help Maffew! In that case, use 7A if you're aiming for a dark blonde, in which case your hair should be a golden orange colour before you tone. If you want a medium blonde, use 8A and your hair should be gold before you tone. You don't have to tone your hair right after bleaching. It's also fine to use a demi-permanent. Your hair becomes porous after bleaching though, so it might not wash out. If you're worried that you won't like the colour, try a semi-permanent instead and that will wash out easier. If you want to use Wella's Color Touch semi-permanents, it'd be 7/1 for toning dark blonde, or 8/81 for toning medium blonde. 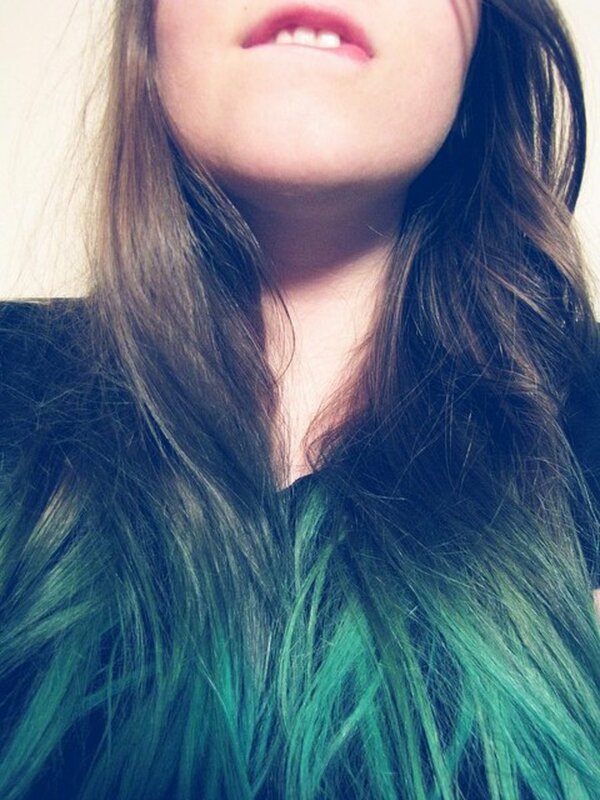 If you like the way the semi-permanent turns out, you can then use the matching permanent dye. Do you have to tone right after bleaching? Or can i do it another day i have bleach but no toner right now. Could u tone with a demi permanent? Just in case i don't like the color so i could wash it out in six wks and try another? Then when i find one i like look for a more permanet option. Wow you just made that really easy t understand. Thanks. I plan to use Color Charm. I would recommend using an ash dye that is one level lighter than your desired colour if you're using it as a toner. This would mean that if you're after a medium blonde, you would tone that with a light ash blonde. Though, since you're after more of a golden caramel colour, you could get good results just using a natural shade mixed with a caramel shade. This will be more reliable for your particular colour. The mix of a natural shade helps to tone down some of the gold and orange tones from the bleach without taking them away entirely. You can see by looking at that chart that if you wanted a medium blonde, for example, you would need to reach a gold colour before you tone. 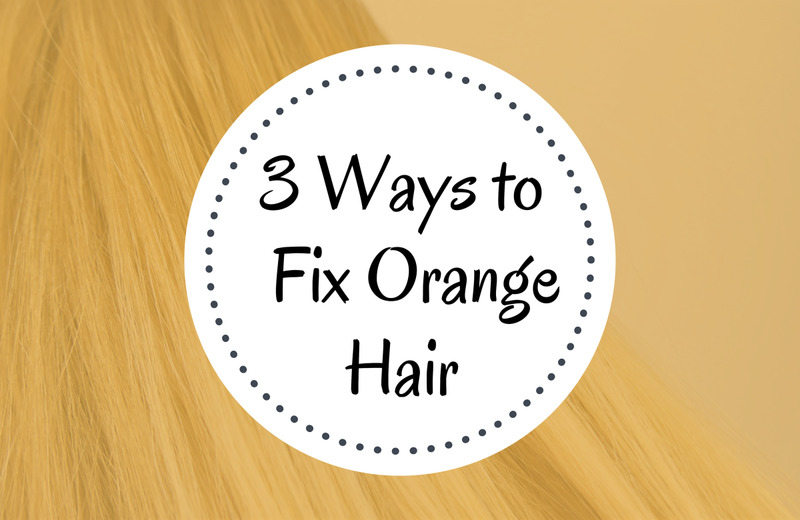 If you wanted a dark blonde however, you would need to reach a golden orange colour. This will help you determine what you need to bleach your hair to before toning. It will also tell you, using what I said above, that the toner used should be a level lighter than the colour you want to reach; especially if using an ash. As for the brand, were you using Wella Koleston or Wella Color Charm? If you're able to tell me which of these you're using, and the exact colour you want, I can tell you which shade you can use to get the right colour. I am aiming for a Golden Caramel Blonde color. I believe I have neutral undertones, a mixture of warm and cool. I have light peachy golden skin, that tans easily, but I prefer to stay out of the sun and keep it pale. I have hazel eyes, blue-gray with gold flecks, which makes them appear green. I would love a color that brings the gold and green out of my eyes. My hair is currently an auburn. I understand I need to bleach my hair to a pale golden orange and tone with Ash how do I know what ash color to buy? I use Wella permanent color. Would I use a Dark Ash Blonde, a Medium Ash Blonde or something else? I do not want my hair to end up too dark or too ashy. Golden Caramel Blonde - Any advice would really help! Thanks your so awesome!